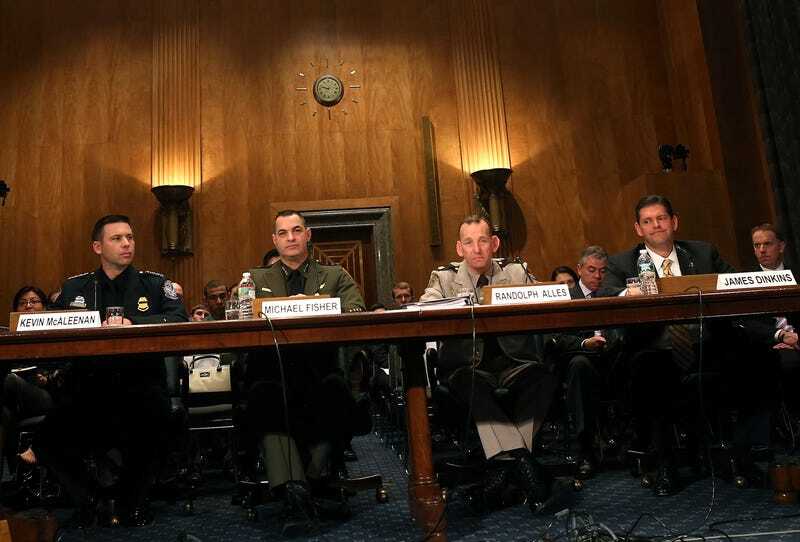 Kevin McAleenan of U.S. Customs and Border Protection, Michael Fisher, chief of the U.S. Border Patrol, Randolph Alles, of the Customs and Border Protection’s Office and James Dinkins, of Homeland Security Investigations at U.S. Immigration and Customs Enforcement, participate in a Senate Homeland Security hearing on Capitol Hill, April 10, 2013 in Washington, DC. President Trump is removing U.S. Secret Service Director Randolph “Tex” Alles from his position, because he doesn’t have any idea what being president requires. On Sunday, Homeland Security Secretary Kirstjen Nielsen resigned for her position as the most deplorable person under Trump not named Sarah “Suckabee” Sanders. It’s been reported that Nielsen was going to resume talking with God and possibly move herself out of hell by leaving the administration, and therefore the continuous separation of migrant children from their families while under her watch. Now, Trump pointed to his KFC chicken bucket at Alles and then back to his empty bucket, which he turned upside down, which White House chief of staff Mick Mulvaney knew meant that Alles, whose direct report was Nielsen, was to be fired. “The Secret Service recently came under scrutiny for its handling of an incident in which a Chinese national was allowed to enter President Trump’s Mar-a-Lago club,” The Hill reports. Apparently all of the firing, or resigning—which is basically firing but I beat you to it—is part of a purge started by White House puppet master Stephen Miller, who believes that the only way to stop migrants from flooding America is by building a wall as tall as the heavens to keep out the Night King and white walkers. More announcements are forthcoming as several outlets are reporting that Citizenship and Immigration Services Director Frances Cissna and the Office of the General Counsel’s John Mitnick are on their way out the door.